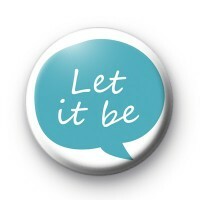 Blue Let It Be Badge inspired by John Lennon and the Let It Be lyrics. Designed in white with a lovely light blue love heart which reads Let It Be in a lovely white font, this badge is perfect for the positive & uplifting people amongst us. Our positive slogan badges and mindfulness badges are always popular & help spread a little joy in an otherwise hectic & crazy world. We have a great range of positive slogan badges & uplifting message badges, perfect for those of us who are a little more spiritual & looking for joy. Be sure to check out the rest of our positive badges and slogan badges on the website. We have thousands of designs to choose from. Standard 25mm button badge made by hand in our family workshop.